The Institute for Veterans and Military Families (IVMF) at Syracuse University has received a generous $50,000 sponsorship from Travelers toward programming for the IVMF’s Arsenal of entrepreneurship programs. This is the second sponsorship IVMF has received from Travelers. Sponsorship dollars will be evenly split between two Arsenal programs: Veteran EDGE and V-WISE – Veteran Women Igniting the Spirit of Entrepreneurship. 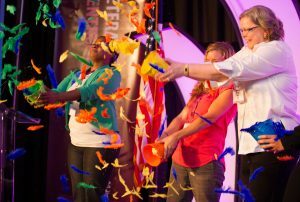 Veteran EDGE is a four-day conference dedicated solely to veteran and military spouse business owners and the ecosystem that supports them. Stakeholders, IVMF program graduates, and veteran and military spouse-owned businesses from around the country will gather to network, and learn about the latest opportunities, best practices and resources available to their growing companies. Veteran EDGE will be held Feb. 28-March 3, 2019, in Dallas, Texas. V-WISE is a women-focused training program in entrepreneurship and small business management that provides tools, ongoing support and business mentorship to veterans, active-duty service members, and military spouses aspiring to become successful entrepreneurs. The 21st V-WISE will be held in Atlanta from May 31-June 2, 2019. To date, the program has graduated over 3,000 women — 65 percent of whom have launched a business; 93 percent of which are still in business today. The support from Travelers will be used to help minimize conference attendance costs for veterans and military spouses. In addition, Travelers experts will provide business continuity education to conference attendees as part of the Small Business Risk Education Program (SBRE). SBRE provides safety risk management education for minority- and women-owned small businesses in select markets throughout the country. The sponsorship from Travelers is a direct investment into our nation’s veterans, service members and their families.